Some questions are always being postponed. Sometimes you just don’t see a potential partner, the perfect match, despite him being so close. Don’t hesitate! Use the services of HYPEREGIO now, to benefit with your company and with your projects! Your local contacts, our HYPEREGIO technology transfer and BDS managers, will happily support you free of cost as your personal advisors. 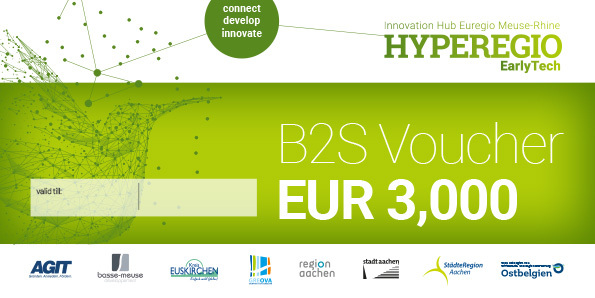 The HYPEREGIO “B2S Voucher” offers the unique opportunity to examine and to analyse the initial basis of your innovative ideas for projects, services or products together with an experienced partner: A knowledge provider from a neighbouring region within the Euregio Meuse-Rhine. With the B2S Voucher you can cover the cost of this initial study up to € 3,000. Get in contact with your regional antenna to pre-check the feasibility of your voucher activity. Read guide for applicants and submit your application. On short-term partner meetings your application will be checked on eligibility and assessed. Approved applications can start their cross-border activities immediately. Six weeks after you have provided the relevant documentation of your activity your payment will be reimbursed.